One of the world’s greatest natural attractions has some profound lessons about the age of things. We live near Niagara Falls—one of the must see sights in the world. Whenever we pick up guests from Toronto airport, one of them usually asks, ‘Don’t you live near Niagara Falls?’ My wife and I know all too well what the next question will be! We have seen the Falls so many times with guests, that we feel we know them intimately. In the mid-1800s the views of a lawyer-turned-geologist, Charles Lyell, influenced the scientific community to accept the idea that the earth had been shaped by ‘slow and gradual’ processes over countless millions of years. Let’s see how Lyell used the Niagara Gorge to undermine the chronology of the Bible. In 1841, the Falls were much harder to reach than they are today. Late that year, Lyell visited the area and did his research to determine the approximate age of the gorge that was excavated by the Niagara River.2 No one disputes what Lyell saw; you can go there today and see essentially the same thing. 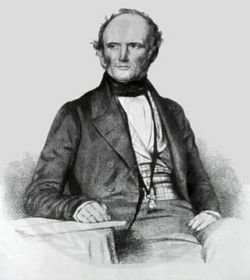 Charles Lyell (1797–1875) whose geological theories were very influential in leading Darwin to his theory of evolution. 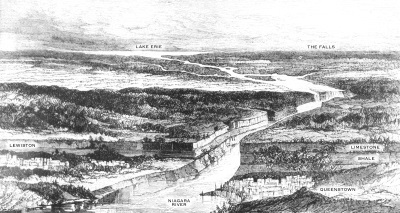 He noted that the gorge cut through an elevated tableland and extended about 11 kilometres (seven miles or 35,000 feet) from the Falls down to Queenston.3 He observed that the walls of the gorge, 60–90 metres (200–300 feet) high, were basically composed of two layers: limestone on top, and shale beneath. He reasoned that the water and spray had scoured away the soft shale, leaving the overhanging ledge of hard limestone, which helped protect the shale from the full force of the falling water. Lyell was told that large chunks of limestone would regularly break off and fall into the gorge. He could see how cracks in the limestone would fill with water. As the water froze in winter it expanded, weakening the limestone, and causing spectacular sights when large chunks broke loose, crashing into the gorge. Lyell wrote, ‘[T]he sudden descent of huge fragments in 1818 and 1828 is said to have shaken the adjacent country like an earthquake.’4 Once they broke off, they exposed the shale to renewed rapid erosion. When Lyell returned to England, he reported that he had scientifically determined that the Niagara Gorge was 35,000 years old, much older than the Bible allowed. 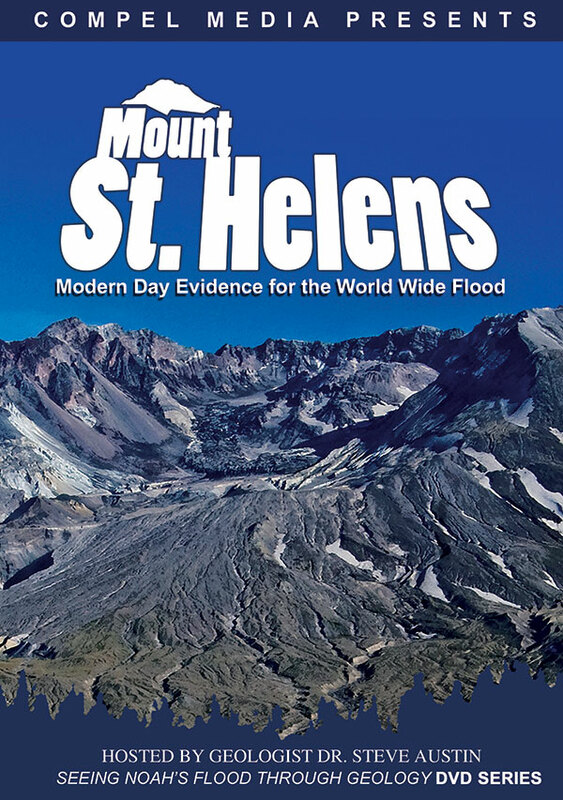 Few people actually read the report that he published in a revised edition of his book, Principles of Geology. Even fewer had any knowledge of Niagara Falls in those days—fewer still had seen it. Since Lyell was a respected English gentleman, most people blindly accepted his estimate. They readily understood how water erodes rock, and this made Lyell’s report all the more believable. Overall, rather than adopting a ‘wait and see’ attitude, the Church capitulated to these long ages, even though they contradicted the Bible. This was tragic, because Lyell’s conclusions were based on a number of logical fallacies. However, the damage was done, and increasingly people began to doubt the Bible, assuming its chronology was not reliable in the light of what Lyell had claimed. Indeed it was an early edition of Lyell’s book that greatly influenced Darwin, when he read it on his famous voyage on HMS Beagle. By 1859 when Darwin’s book On the Origin of Species was published, Lyell’s arguments promoting a vast age of the earth, and undermining confidence in biblical chronology, had greatly helped prepare the way for evolution’s acceptance. What Lyell wrote in Principles of Geology about what he saw on his trip to Niagara Falls was sufficient to satisfy the curiosity of most readers. But what he omitted would have undermined his age estimate to any alert reader. The old adage of ‘never let the facts spoil a good theory’ seems to apply here. Lyell ignored the reports from Mr Blackwell that residents had observed the Falls recede by more than one metre (three feet) a year. At that rate the gorge would be less than 12,000 years old, which was in the ballpark of the biblical chronology, given the uncertainties in the estimates. That was not old enough for Lyell, who was looking to promote his slow-and-gradual geological theories. So he chose to disregard the data and conducted his own investigation of the residents. A panoramic 1872 woodcut of Niagara Gorge looking south from Lake Ontario to the Falls and Lake Erie in the distance. Click for larger view. Lyell does not explain how he did it, but strangely, he arrived at a reduced rate of 0.3 metres (one foot) a year. This ‘conjecture’, as he called it, much better suited his purpose. Since the gorge was 35,000 feet long, he concluded that it must be 35,000 years old!2 This estimate further undermined people’s confidence in the biblical chronology. 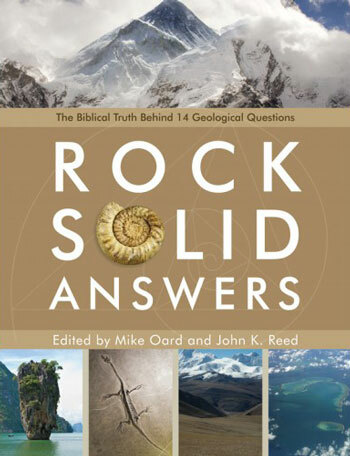 And Lyell saw the Bible as the major obstacle to the general acceptance of his geological theories. Lyell’s conclusion was wrong. Later analysis of eyewitness reports from 1842 to 1927 confirmed the high rate of erosion—1.2 to 1.5 metres (four to five feet) a year.6 The residents of Lyell’s day had been conservative! This rate places an upper limit of 7,000 to 9,000 years for the gorge. However, we now know the gorge eroded even faster than this, so this age is still too high (see Erosion at Niagra Falls supports the biblical time-scale below). Unlike historical dating, which depends on direct observation, all ‘scientific’ dating methods rely on assumptions about what happened in the past. Without such assumptions, no age can be calculated. No matter how reasonable these assumptions may seem, we can never be certain they are true unless we have eyewitnesses for the entire time period in question. We know that the assumptions Lyell made were wrong, because he ended up with a greatly inflated age that did not agree with the Bible. Indeed, his exaggerated 35,000-year age has long been abandoned, even in the geological literature, which now quotes 12,000 years for the age of the gorge—still much older than the Bible allows. But even this age is not based on the best estimates for the erosion rate of the Niagara River. These would still give an age that was ‘too young’. Rather, the 12,000 years is based on radiocarbon dating of a piece of wood from St David’s Gorge. Readers of Creation will already know how inaccurate radiometric dating is!7 Radiocarbon dates are too old because the past effects of Noah’s Flood on the earth’s carbon balance are ignored.8 When these effects are properly included, the radiocarbon age agrees with the Bible. Interestingly, rather than supporting Lyell’s concept of an old earth, Niagara Gorge provides wonderful consistency with the biblical time-scale. When all the factors that affect erosion are considered, the calculated age agrees quite nicely with the gorge forming since the ice cover retreated about 3,800 years ago, after the post-Flood Ice Age.9 (see Erosion at Niagra Falls supports the biblical time-scale below). The hype in the newspaper headlines is rarely justified when the full report is read, or is reviewed by others. If the conclusions contradict the Bible, we should examine the assumptions and reasoning and find where they are wrong. If you read with a critical eye, you should start to see inconsistencies in the material. The Bible is true no matter what men say. The burden of proof rests on the scoffers. If you look down through history, the scoffers have a 100% average—of being wrong! Given enough time, any report that appears to undermine the Bible will itself be undermined by later reports! Beware of the so-called ‘proofs’ the scoffers try to use (cf. 2 Peter 3:3–7). More than one hundred years ago, Robert Lewis Dabney pointed out that it is not good enough for the scoffer to propose a hypothesis that may be true, and claim thereby that the Bible is disproved. Rather, they must show that their hypothesis must be true; that there is no other possible explanation.10 On the other hand, we don’t have to prove that their hypothesis is wrong. We just need to show that other possibilities exist. Dabney wrote in 1861 in response to the compromises the Church had made with science in his day. He even discussed many ‘proofs’ used by scientists to undermine the Bible, and showed them all to be fallacies. The tragedy was that too few listened! Let’s learn from history and not repeat the same mistakes today. Let’s stop compromising and take a stand on the Bible. Remember, history has shown that, given enough time, biblical scoffers are always proved wrong, but the Word of God is true. Lyell assumed that the rate of erosion was constant in the past. Apart from eyewitness accounts, we cannot verify this assumption. We can readily calculate the erosion rate since European settlers began observing the Falls, but we cannot say with confidence what it was before that. 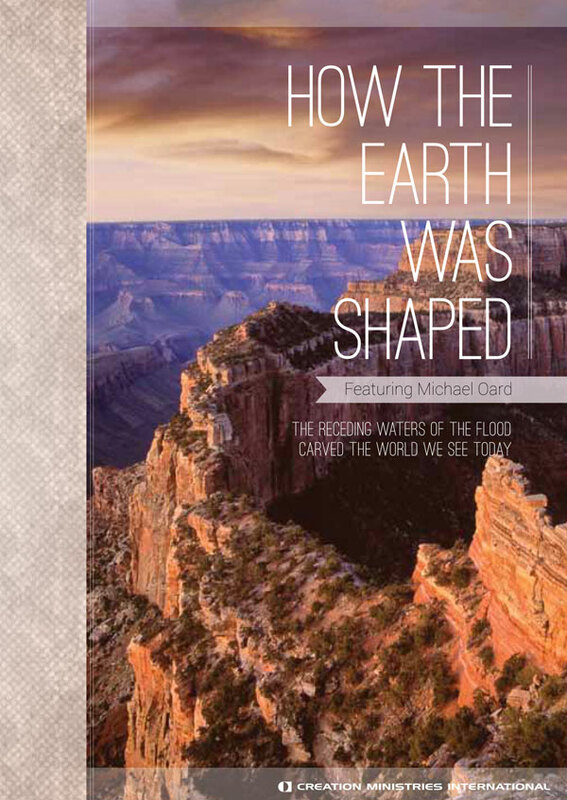 Many factors affect how fast the Falls eroded the gorge, and much evidence suggests that the erosion rate was considerably faster in the distant past. The geological strata are not the same thickness over the whole length of Niagara Gorge. The casual visitor would not notice this variation because the shale layer is mostly covered with vegetation or crumbled limestone. But, to the alert observer, the change in thickness is obvious. At Goat Island, near the Falls, the limestone layer is about 27 metres (90 feet) thick. The underlying layer of shale is about 21 metres (70 feet) thick. Three kilometres (two miles) down from the Falls, at the suspension bridge, the hard limestone layer is only about 14 metres (45 feet)—half as thick as at the Falls. It stays this thickness for the remaining eight kilometres (five miles) to Queenston. The falling water erodes the soft shale quickly, leaving a hard limestone overhang that tends to protect the shale and slow erosion. However, once the limestone overhang breaks off, the soft shale again erodes quickly. The thinner limestone layer would have broken off much easier; hence, the first eight kilometres of the gorge would have eroded much faster than the last three kilometres. There was a greater flow of water in the river in the past. However, although Lyell recognised this, he illogically adopted an erosion rate that was much less than that observed by the residents. With more water the rock would have eroded faster—not slower. The gorge is much narrower than the existing Falls, only one-quarter to one-half the width. A narrower Falls means a greater flow of water over the spillway and faster erosion. Again, although Lyell recognised this,1 he did not factor it into his calculations. After the biblical Flood, we would expect the rivers to have contained much more sediment than they do today. This would have also increased the erosion rate. The hard limestone layer sometimes breaks off in huge blocks instead of eroding slowly. Although Lyell knew this, he did not factor it into his calculations, for this would have lowered his age estimate. The shape of the crest of the Falls greatly affects the rate of erosion. It is now known that, rather than the smooth horseshoe shape seen today, a notched crest has existed in the past.2 With a notched crest, the hard rock layer breaks off much sooner than for a smooth, horseshoe crest. In fact, when the spillway was notched from 1875 to 1886, it eroded 60 metres (200 feet)—or 5.5 metres (18 feet) a year!3 Significantly, where the gorge eroded quickly, it is not as deep. It is only where erosion was slow that there was time to erode out a deep pool. A good part of the gorge is shallower than the Maid of the Mist pool, next to the Falls, indicating that erosion was faster. Ice erodes rock much faster than water. Meltwater under pressure beneath the ice is believed to have carved out the finger lakes in New York State during the Ice Age, and a similar process may have excavated part of the Niagara Gorge. In any case, water from the melting glaciers would have greatly swelled the flow of the Niagara River. Lyell assumed that the Falls excavated the whole gorge. Again, without eye-witness accounts, we cannot verify this assumption. It is likely that the gorge was partly excavated during Noah’s Flood by receding floodwaters, and then by glacial action during the Ice Age. The top limestone strata are thinner in this downstream part of the gorge. Philbrick, S.S., Horizontal configuration and the rate of erosion of Niagara Falls, Geological Society of America Bulletin, 81:3723–3732, 1970. Philbrick, S.S., What future for Niagara Falls? Geological Society of America Bulletin, 85:91–98, 1974. See Oard, M.J., Ref. 9. Taylor, I., In the Minds of Men, 4th ed., TFE Publishing, Toronto, ON, Canada, pp. 81–84, 1999, describes how the Niagara Falls were used to help change the thinking of a whole generation. Return to text. Lyell, C., Principles of Geology, 11th edition, D. Appleton and Co., New York, NY, USA, 1:354–358, 1873. Return to text. In those days, Queenston was spelled Queenstown. Return to text. Ref. 2, p. 356. Return to text. Rodgers, H., On the Falls of Niagara, American Journal of Science and Arts (New Haven), xxvii:326–335, January 1835. Return to text. Ref. 1, note 5, p. 447, reports the recession rates summarised by Tovell, W.M., The Niagara River, Royal Ontario Museum, Toronto, ON, Canada, 1979. Return to text. See for example Snelling, A.A., Radioactive dating failure, Creation 22(1):18–21, 1999; Geological conflict: young radiocarbon date for ancient fossil wood challenges fossil dating, Creation22(2):44–47, 2000; Q&A: Radiometric Dating. Return to text. Batten, D. (ed. 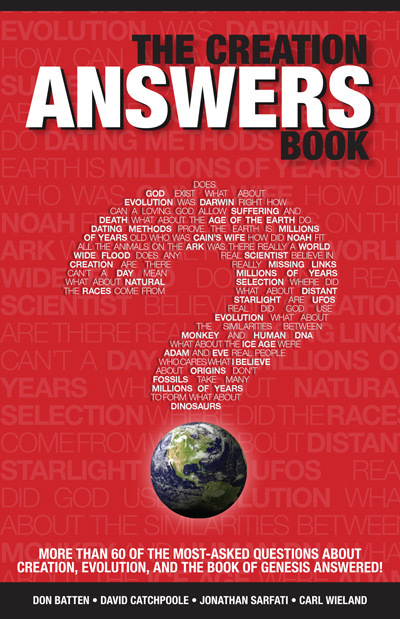 ), The Answers Book, Creation Ministries International, Brisbane, Qld, Australia, pp. 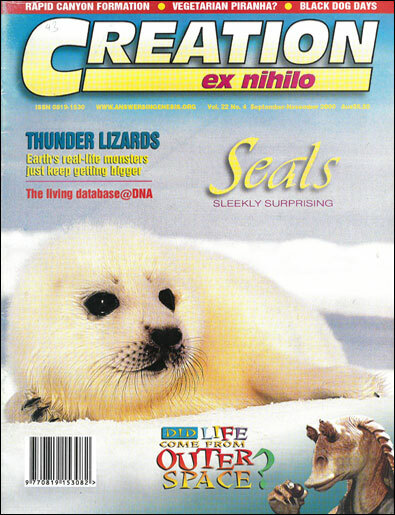 63–82, 1999. Return to text. See Oard, M.J., An Ice Age Caused by the Genesis Flood, Institute for Creation Research, El Cajon, CA, USA, 1990. Return to text. Dabney, R.L., Discussions of Robert Lewis Dabney, 3:136–139, 1892. Republished by Banner of Truth, Carlisle, PA, USA, 1982. The original article cited in the book was first published in the Southern Presbyterian Review, July, 1861. Return to text.